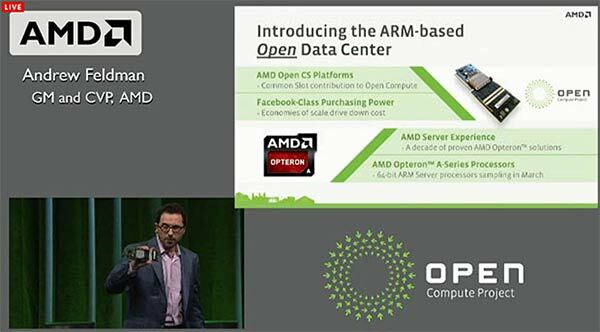 AMD unveiled its first ARM-based server chips at the Open Compute Summit V in San Jose, California yesterday. The new AMD Opteron A1100 series of chips, codenamed 'Seattle', will be fabricated using the 28nm process. Sampling of these four or eight core ARM Cortex-A57 processors by customers should start in the current quarter along with the introduction of a development platform to aid software design for the servers. AMD also said that it would introduce a new micro-server design making use of the Opteron A-series, as part of the Open Compute Project. Suresh Gopalakrishnan, CVP and general manager of the AMD server business unit said that the AMD Opteron A-series addresses the changing needs of data centres. 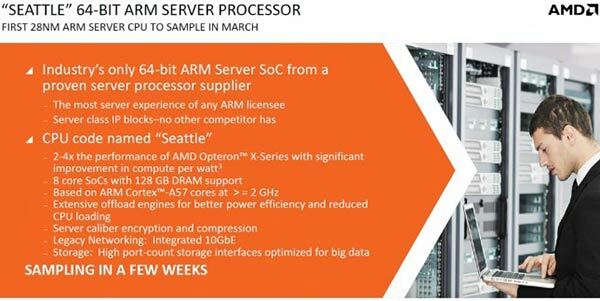 He added that "The new ARM-based AMD Opteron A-Series processor brings the experience and technology portfolio of an established server processor vendor to the ARM ecosystem and provides the ideal complement to our established AMD Opteron x86 server processors." Linux environment based on Fedora, which provides developers with a rich set of tools and applications including; Standard Linux GNU tool chain, Platform device drivers, Apache web server, MySQL database engine, and PHP scripting language, Java 7 and Java 8. At the keynote address, Andrew Feldman, another CVP and general manager of the AMD server business unit, said that 'Seattle' marks the dawn of a new era for data management, reports ZDNet. He went on to say that this is the first generation of many "There will be generation after generation after generation and each will improve and be more closely tied to the software and hardware enclosure it lives in." Feldman asserted that ARM CPUs will have a "monstrous role" in future data centres in the near future as "in the history of compute, smaller lower-priced CPUs have always won". 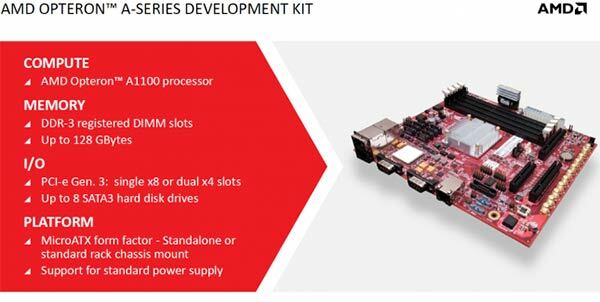 AMD will be at the forefront of this ARM-powered server wave, he promised. While sampling of the chips and developer boards is expected this quarter we don't know when mass availability of these new Opteron chips will begin. It certainly seems the right way to go for these power hungry data centres. Personally I would rather that matx be a mitx size board, there are now quite a few mitx size ‘server’ cases while matx is still fairly limited. Now I'd happily take a punt on a eight core board with onboard raid with 8 sata…. in theory it would be fairly low power and would be ideal for an ‘always on’ home server.